Some of the most prominent names in the global IT asset management software market have a very strong presence in North America, making the regional market an immensely competitive one. According to a study by Transparency Market Research (TMR), ServiceNow Inc., Cherwell Software Inc., Hewlett Packard Enterprise Development, and Aspera Technologies, Inc. are some of the leading names operating in the North America market. In order to gain competitive advantage the market players are focusing on mergers and collaborations and partnerships. Besides these, companies offer customized solutions to help customers meet the ever-rising complexities in the IT environment. Between 2016 and 2024, the market is expected to rise at a CAGR of 6.9%. 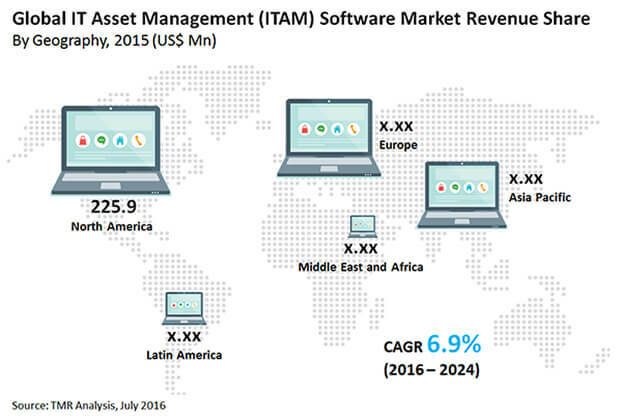 At this pace, the global IT asset management software market will reach US$13 bn by the end of 2024 as compared to US$708.9 mn in 2015. On the basis of size of enterprise, large enterprises will account for the leading share in the global market. Based on end use, IT and telecom sector is forecast to lead the global market. Regionally, the global IT asset management software market comprises Asia Pacific, Latin America, Europe, North America, and the Middle East and Africa. Among these regions, North America is forecast by TMR to continue dominating the global landscape through the course of the report’s forecast period. Several factors will support growth of the global IT asset management software market, the rising focus on asset inventory management being one of them. The software allows organizations to monitor the utility of software bought and it also identifies if there is a need of upgrading either the operating system or the software. In addition to this, IT asset management software has proved helpful in the identification of illegal installation, thus preventing various vulnerabilities while ascertaining compliance with popular security policies. These advantages offered by IT asset management software have played a crucial role in fuelling its demand worldwide. Furthermore, the rising demand for centralizing and automating IT infrastructure will give thrust to the market’s growth pace in the coming years. With an increasing number of enterprises around the world inclining towards consolidation, besides establishing centralized IT operations, the demand for IT asset management software is likely to surge further in the coming years. On the downside, organizations struggling to reduce their operational expenses may find it difficult to deploy IT asset management software. This software incurs increased expenses, which may limit their implementation in organizations across underdeveloped countries. Nonetheless, the rising demand from energy and utilities industry will offer attractive growth opportunities to the global market over the course of the forecast period. Driven by this and several other factors the market will continue exhibiting a positive trajectory.